The Draft Environmental Impact Report documents that the proposed Conejo Creek development would add 40,948 additional cars per day to our roadways. The Conejo Creek development of 2,500 homes is proposed for the East end of town at the bottom of the Conejo Grade, in addition to the new Springville housing development of 1,325 homes that is now happening in the West end of town. 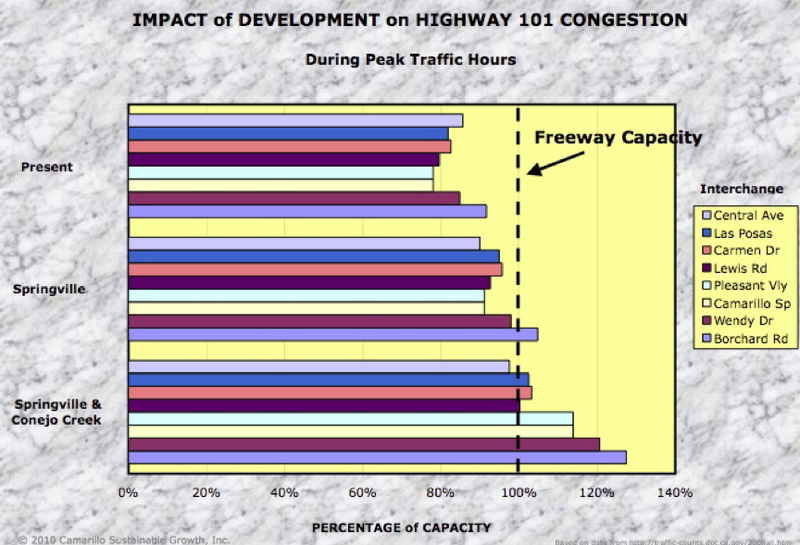 The accompanying chart (below) depicts the impact of two City of Camarillo residential developments on the ability of the Ventura Freeway (The 101) to accommodate the increase in traffic that they will generate. This graph refers to vehicular traffic generated by the RESIDENTIAL UNITS ONLY and does not consider traffic generated by the retail or commercial enterprises associated with these projects. A 1440 residence project that is located on the North side of The 101 between Las Posas Road and Central Avenue. Retail space is also included in this project. This development, along with the commercial expansion on the South side of The 101 west of the Home Depot, mandated the construction of the new freeway interchange at that location. This project is signed, sealed and approved by the Camarillo City Council and construction may begin at any time. Present = Before either of the two developments is built. Springville = When these 1440 homes are built. Springville & Conejo Creek = When the total build-out of 3940 homes in both projects is completed. Note that there are three clusters of eight horizontal bars each on the graph. Each cluster corresponds to the stage of development as described in the Categories (above). The individual bars represent the percentage of capacity of The 101 at the corresponding interchange. For example: the blue bar second from the top of each cluster represents the percentage of capacity of traffic on The 101 at Las Posas Rd. (from the ”Interchange” table to the right of the graph). At present, traffic on The 101 passing Las Posas Road during the peak hour is at about 82% of capacity. Once Springville is built it will be about 95% of capacity. Once (and if) both Springville and Conejo Creek are built, it will increase to 102% which is, theoretically, more traffic than the freeway can accommodate. The vertical “Freeway Capacity” line on the right side of the graph represents 100% of the number of cars that can move relatively freely on the freeway. According to the State of California Department of Transportation (DOT) the capacity is 2200 vehicles per lane per hour (VPH). In most locations our beloved 101 is six lanes wide so the capacity is 2200 x 6 = 13,200 VPH. This maximum throughput occurs at about 60 MPH. Other parts of the world use 2000 VPH or so which might go a long way in explaining our freeway situation. The chart is a relatively simple (and conservative) calculation of the volume of traffic that would be “on” the freeway and assumes that it can actually get there. It was prepared using traffic counts provided by the DOT, which identifies the location of traffic by correlating the volume number to a freeway interchange. We used all of the interchanges in Camarillo plus two up the hill in Newbury Park (Wendy Drive and Borchard Road) because the impact on them is so dramatic. The DOT numbers we used are Peak Hour values. These are not identified by time-of-day but undoubtedly occur during the morning or evening commute period. We used 2008 because that was the latest year available when we prepared this in late 2010. Remember that the chart above only takes into account the NUMBER OF CARS ON THE FREEWAY. 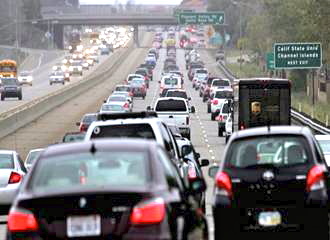 Camarillo Sustainable Growth (CSG) does not have the resources to determine the amount of delay that will result from adding a substantial number of vehicles to our local roadways and freeway ramps. Getting on and off the freeway is a whole ‘nother issue and will require computer models to calculate. The Environmental Impact Report process requires that these delay issues be identified and any negative impact mitigated. To which we say, “Good luck with that!”.